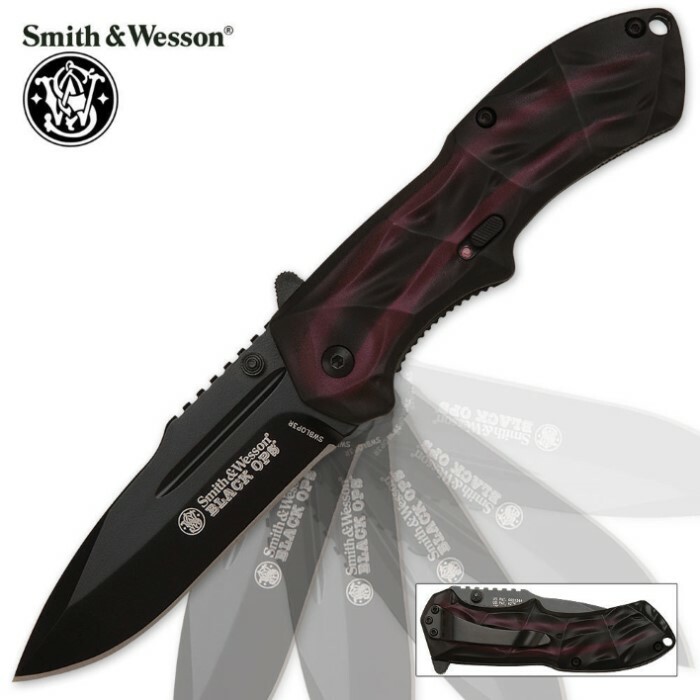 Smith & Wesson Black Ops Assisted Opening Pocket Knife Red | BUDK.com - Knives & Swords At The Lowest Prices! The Third Edition in the Black Ops series from Smith & Wesson, this Black Ops 3 tactical folding pocket knife offers a unique, ergonomic handle pattern constructed of impact-resistant aluminum, this time in a classic red that is sure to get noticed. Each 4034 stainless steel blade is teflon coated and features the M.A.G.I.C. assisted-open mechanism that can be activated by the ambidextrous thumb stud or the finger actuator on the back of the blade. This is an all around AMAZING knife, honestly, i thought id have to spend hours sharpening it to be satisfied, but this thing was razor sharp right out of the box!!! As a country man, i can say that u need a tough, sturdy, dependable, and sharp knife to make it, this knife is all of these and more!!! All of my friends were judgemental when i got it, but after seeing how it has held up, they all want one too!!! This is an awesome knife to own and use, best knife ive ever owned and purchased from BUDK. there is absolutely NO reason u wouldnt want this knife!! It is the best looking knife i got and opens faster then any knife i got even my sog knife. Perfect knife good for anyone who needs it.